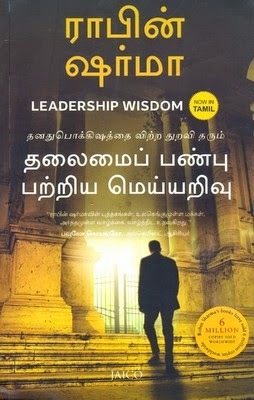 Now In Tamil In this eagerly awaited sequel to the phenomenal national bestseller The Monk Who Sold His Ferrari, leadership guru and renowned professional speaker Robin Sharma shares a remarkable step-by-step system that will restore trust, commitment and spirit within your organization while transforming the way you lead your life. With masterful insight and brilliant simplicity, author Sharma has distilled timeless wisdom for visionary leadership into 8 immensely practical lessons that leaders, managers and entrepreneurs can immediately apply to boost morale, liberate loyalty and send productivity soaring in these topsy-turvy times while also creating far more fulfilling personal lives. Written as an easy to read fable, Leadership Wisdom is a book that will move you deeply and inspire you to become the kind of leader who touches lives, adds true value to the world and leaves a legacy that lasts.